Very excited about our guest speaker talking to us about Rotaract. Rotaract provides an opportunity for young men and women to enhance the knowledge and skills that will assist them in personal development, to address the physical and social needs of their communities, and to promote better relations between all people worldwide through a framework of friendship and service. If you wish to attend our guest speaker evening, please let us know no later than 10am Friday before. Cost is $30 which includes dinner and dessert, coffee/tea. Pride of Workmanship Award Scheme theme is “Do it Once, Do it Well – Build a Better Australia”. 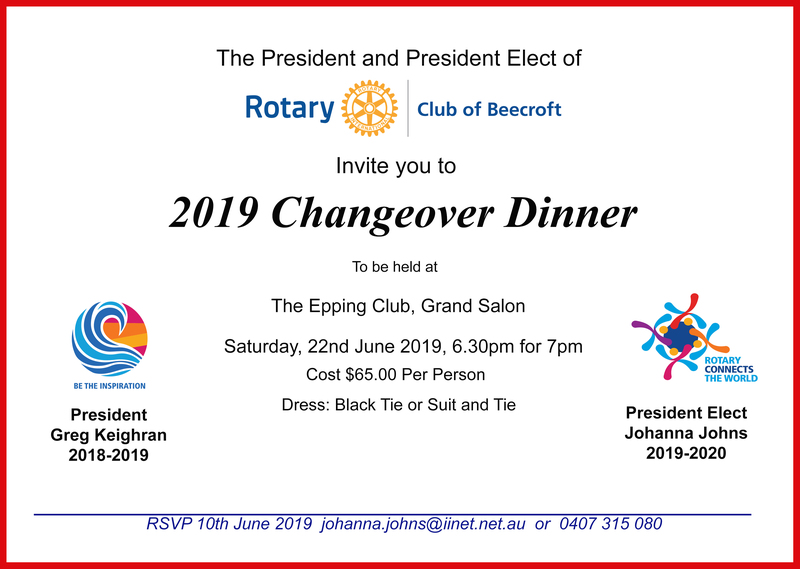 It provides employers with the opportunity, through Rotary, of recognising and acknowledging the efforts and contributions of an employee who consistently achieves an overall high personal standard and work performance.Today we celebrate those recognised in our local community. Rotary Beecroft Club Committees meet to plan, organise and execute their upcoming events and projects. Rotary member Anne Wright will do a hands on session on 'how to navigate on the website'. Very excited about our guest speaker talking to us about MUNA (Model United Nations Assembly). MUNA is an annual, two-day weekend event that is part of an International Rotary project to educate senior high school students (years 10 - 12) on the United Nations organisation and its vital commitment to world peace, in addition to health, education and living standards around the world. The event provides an excellent forum for students to develop and practice their public speaking skills whilst debating on topical world issues. Very excited about our guest speaker talking to us about the environment. Watch this space for more info coming soon! We are very excited to be able to have Professor David Booth come and talk to us about Sydney Harbour. Join us! Our guest speaker Professor Gavin Marx will be talking to us about Improving Cancer Outcomes. Very excited about our member and guest speaker Mark Anderson giving us an update on Polio.